…The New York Times headline of Oct. 26 even more dubious and deceptive, “Top Earners Doubled Share of Nation’s Income, Study Finds”. The subhead announces “The top 1 percent of earners more than doubled their share of the nation’s income over the last three decades,” but readers must make their way to the sixth paragraph to find that the referenced “report” is actually a historical analysis by the Congressional Budget Office, covering a 28-year span between 1979 and 2007, and pointedly concluding before the economic meltdown of 2008. Figures from the IRS, however, demonstrate that since the recession began the rich hardly got richer: the number of Americans earning $1 million or more fell a staggering 40 percent between 2007 and 2009 (declining to 236,883), while their combined incomes fell by nearly 50 percent—a vastly greater loss than the 2 percent drop in total incomes of those making $50,000 or less. Could anyone make a plausible case for how a massive reduction in the number of top earners (with nearly 200,000 fewer million-dollar incomes) could conceivably benefit the economy, or count as good news for anyone? Nevertheless, the Times chose to stress the inflammatory finding that in the 29 years preceding the Great Recession the top 1 percent of earners (those pesky millionaires and billionaires) boosted their average, inflation-adjusted, after-tax income by 275 percent. Surely worried readers might conclude that such “obscene” enrichment by the greediest would inevitably impoverish the neediest, leaving only miserable crumbs for the beleaguered middle class. But the CBO numbers actually showed that big gains for top earners did nothing to prevent simultaneous (if more modest) improvements by every other income group. For instance, the middle class (the 60 percent of the population in the 21st through 80th percentiles), raised their average inflation-adjusted, after-tax household income by a healthy 40 percent. Even the bottom 20 percent of the population moved ahead during the Reagan, Clinton and George W. Bush booms, lifting their earnings 18 percent…. This next section shows that when Presidents are in office that support unions, the income disparity gap-widens. …But it turns out that the rich actually got poorer under President Bush, and the income gap has been climbing under Obama. What’s more, the biggest increase in income inequality over the past three decades took place when Democrat Bill Clinton was in the White House. The wealthiest 5% of U.S. households saw incomes fall 7% after inflation in Bush’s eight years in office, according to an IBD analysis of Census Bureau data. A widely used household income inequality measure, the Gini index, was essentially flat over that span. 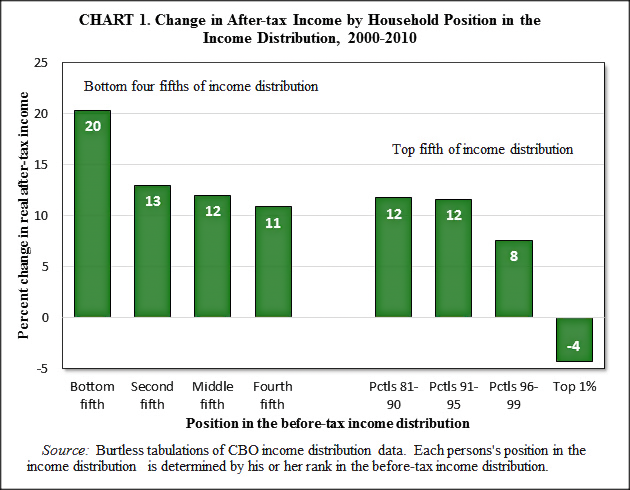 Another inequality gauge, the Theil index, showed a decline. In contrast, the Gini index rose — slightly — in Obama’s first two years. Another Census measure of inequality shows it’s climbed 5.7% since he took office. A similar analysis found that income inequality has fallen among individuals since the early 1990s, but risen among households due to factors such as more marriages of people with similar education levels and earnings potential. Others argue that income mobility matters more than equality. One study found that more than half of the families who started in the lowest income bracket in 1996 had moved to a higher one by 2005. At the other end of the spectrum, more than 57% of families fell out of the top 1%. …The left says current levels of income inequality echo the late 1920s and the Gilded Age. They’ve zeroed in on the richest 1%, citing Census Bureau data showing these top earners “grabbing” more income than the bottom 90%. And income groups in America are not fixed. There’s no caste system here, really no such thing even as a middle “class.” The poor aren’t stuck in poverty. And the rich don’t enjoy lifetime membership in an exclusive club. 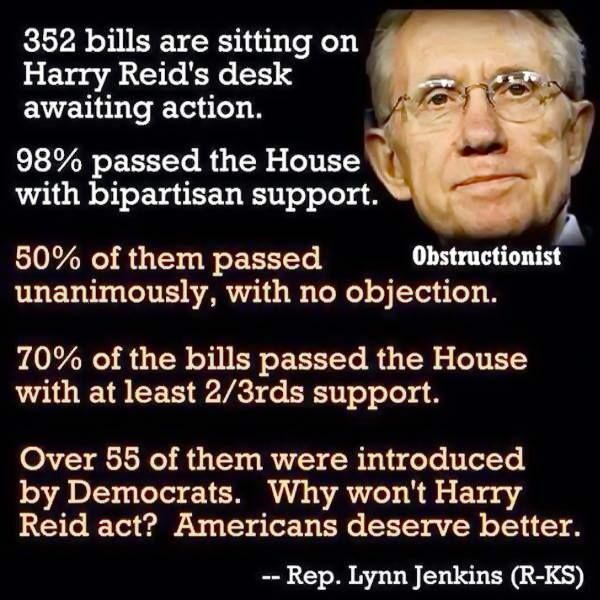 ERGO: the Democratic Party are run by old, rich, white, obstructionist, men. Not the Republican Party. In fact, the richest 8-of-10 counties voted for Obama… and consistently when the states are separated by red-and-blue, the most charitable states are red, the most stingy (greedy) are blue states. And the richest Congressmen are typically Democrats. In a wonderful response to Donahue’s 1979 challenge to Milton Freidman on the issue of greed and if greed has ever caused Dr. Friedman to doubt capitalism. Milton Friedman responded that “the world runs on individuals pursuing their own interests, the great achievements of civilization have not come from government bureaus. Einstein didn’t construct his theory from an order of a bureaucrat. Henry Ford didn’t revolutionize the automobile industry that way. In the only cases in which the masses have escaped from the kind of the grinding poverty you’re talking about, the only cases in recorded history are where they have had capitalism and free trade.” So I wish to proffer another history that maybe, just possibly Forbes is taking into account and Mr. Huizum is not. Another point worth politely rejecting is the definition given to Forbes by Mr. Huizum on freedom: “free from ANY government regulation.” This is a fallacy of straw-man. 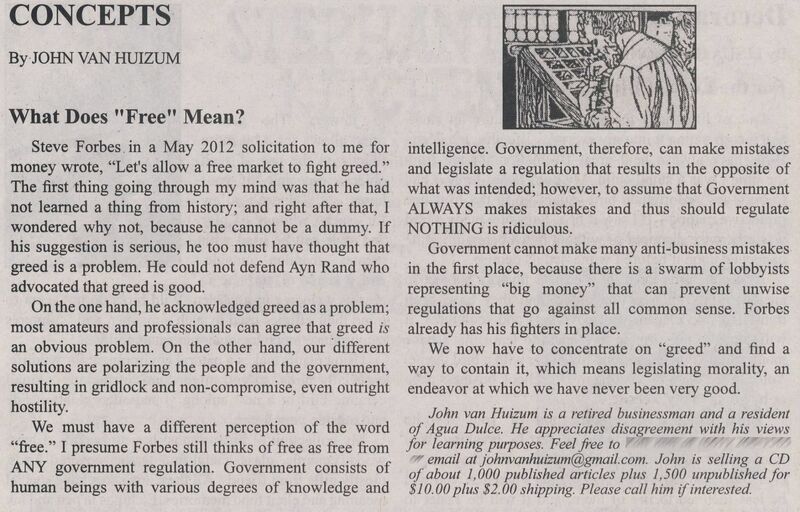 Mr. Huizum does not show a full knowledge of Forbes understanding on this matter. Nor does the facile dealing with this complex issue and the putting forth of a false definition as if-it-were Forbes do this topic justice. One last point, the most important. Unlike big business when it makes mistakes, big government cannot go out of business. Unlike corrupt government, corrupt business cannot print money and thereby devalue a nation’s currency. Businesses cannot coerce you by force (tax liens, garnishing of wages, or armed IRS officials, etc) into an action. So the “greed” of the corporation pales in comparison to the greed of government. Which is why our Founders stated that, “The Constitution is not an instrument for the government to restrain the people, it is an instrument for the people to restrain the government” (Patrick Henry); “Government is not reason; it is not eloquence. It is force. And force, like fire, is a dangerous servant and a fearful master” (George Washington). Thomas Sowell, Basic Economics (New York, NY: Basic Books, 2004), 361. John Van Huizum, Agua Dulce/Acton Country Journal, Vol. XXII, Issue 21 (May 26, 2012), 19.
 a) Person A has position X; b) Person B presents position Y (which is a distorted version of X); c) Person B attacks position Y; d) Therefore X is false/incorrect/flawed. Dennis Prager, Still the Best Hope (New York, NY: Broadside Books, 2012), 35-36. This entry was posted in Dennis Prager, John Stossel, Larry Elder, mantra, Mantras & Myths, Poli-Sci, Pundits & Personalities, Stats/Polls and tagged Income Mobility, Liberal Mantra, Rich Get Richer.